Makovsky was a very fashionable painter. His legacy is incredibly great. We see a young woman dressed in traditional Russian festive clothing. The special colorfulness of this dress impresses. The shirt wore a characteristic name – red. This indicated not its color, but that the clothes were beautiful. In this case, the sleeves were necessarily threaded into special slots on outerwear. That is why this garment was extremely significant. A shirt was worn on the shirt. So called long dress with free sleeves. The collars were not sewn directly on the clothes. For their decoration used luxurious silks and all sorts of pearls. Such a special collar was called a necklace. Kokoshnik was used as a headdress for the holiday. Its hard part was sewn to the cap, which necessarily covered the whole head. Multicolored glass and pearls were used to decorate the glasses. To the very top of this place a mustard cover was attached. It fell freely on the shoulders. For decorating kokoshnikov used downstairs. 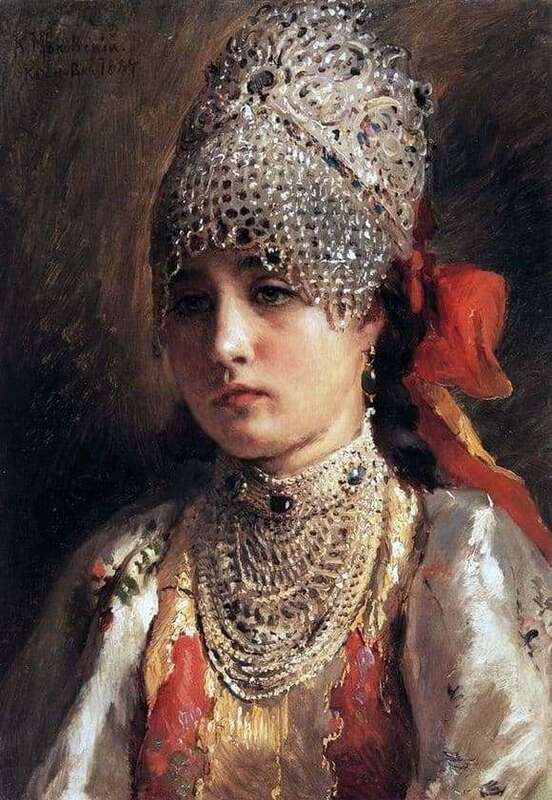 Makovsky most accurately depicts this luxurious costume of Russian women. The heroine is dressed in a traditional shirt with expertly embroidered armor.. The headgear was important. Girls traditionally wore a braid. Graceful strands of pearls and multi-colored ribbons were necessarily woven into it. Makovsky depicts a hawthorn in a festive crown, which is tied at the back with a ribbon. Such a magnificent outfit of Russian women impresses. Makovsky does not feel sorry for the colors and seeks to convey all the details of the dress with maximum accuracy. The background in the picture serves only to set off the magnificence of the dress. Before us is a young girl with regular features. You can feel that Makovsky is admiring her and seeks to convey this special perception of the audience.